As I see it, there are many facets to my apprenticeship, much more than just craft alone - such research and scholarship. Luckily, my teacher Eric is just as knowledgable about the history and evolution of letters as he is in making them, and he has always encouraged me to pursue such lines of inquiry. To this end, and as a result of a recommendation from Eric, I was lucky enough to take a trip to London a few weeks back to view the I Am Ashurbanipal: King of the World exhibition at the British Museum. How cool is this scene? Love the fish! The show, which consisted of numerous Assyrian cuneiform tablets, statuary, and large wall friezes, was a powerful experience. Assyrian carpet motifs carved into a floor tile - fancy. As a lettering artist, I was excited to see cuneiform tablets in person and up close, as I’ve seen plenty in books and online but never in the real. Cuneiform is really the progenitor of our modern alphabet - the most basic tools our trade - so I felt is was really important to do a bit of research in this area and add to my fledgling lettering scholarship. This may look monolithic, but it’s no more than four inches tall! The first, and the most surprising, thing you notice about the cuneiform tablets are how small they are: absolutely tiny! Most of them were no bigger than a candy bar or brownie (can you tell I’m hungry? ), and the symbols themselves are not only equally miniscule, but incredibly dense. Even if I were able to read it, I would have had to use a magnifying glass! How they accurately made these marks is beyond my comprehension. There are captions within the carved scenes - like ancient comic books! But I have to say, my favorite part of the show were the large tablets of low relief carvings. These friezes, some of which were as much as ten feet tall and twenty feet wide, were incredble. They depicted specific scenes of battles or rituals, most during the reign of King Ashurbanipal. The details and sense of movement in the carvings were exceptional. It was amazing to see what can be accomplished with simple low-relief carving. What was even more fascinating was how the Assyrians integrated lettering into the carved scenes as captions narrating the action. I don’t think I have ever seen anything quite like it, especially in something this early. All in all, it was incredible exhibition, and very inspiring to me not only from an artist point of view, but also a craft one, as well. Seeing how craftsmen thousands of years ago, using tools not too different from my own, managed to combine imagery and lettering together harmoniously is very exciting. I always knew lettercarving had a deep and far-reaching tradition, but it, in fact, goes back thousands of years. Let’s hope I don’t leave too much embarrassing work for people to stumble across thousands of year for now. The Assyrians set a high bar! 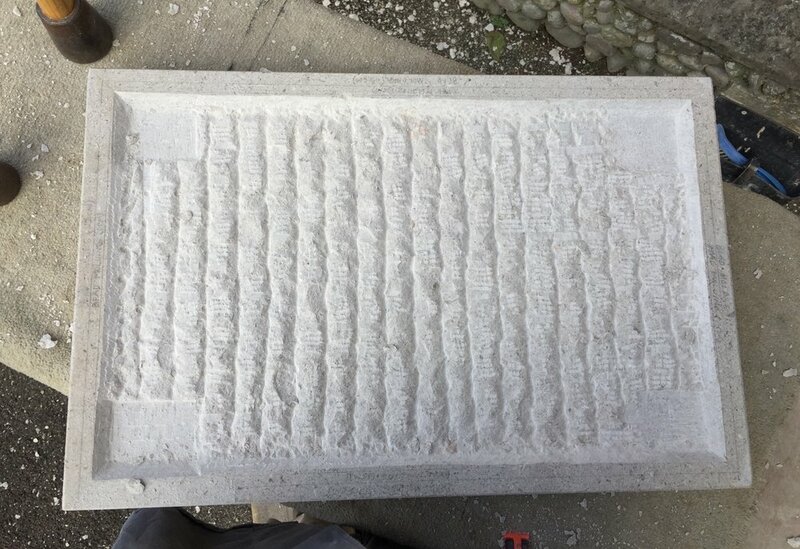 After all of the work that went into masoning my stone - not mention the designing of the letters and the drawing and redrawing of those letters on the stone - the start of carving on my alphabet was a little nerve-wrecking. 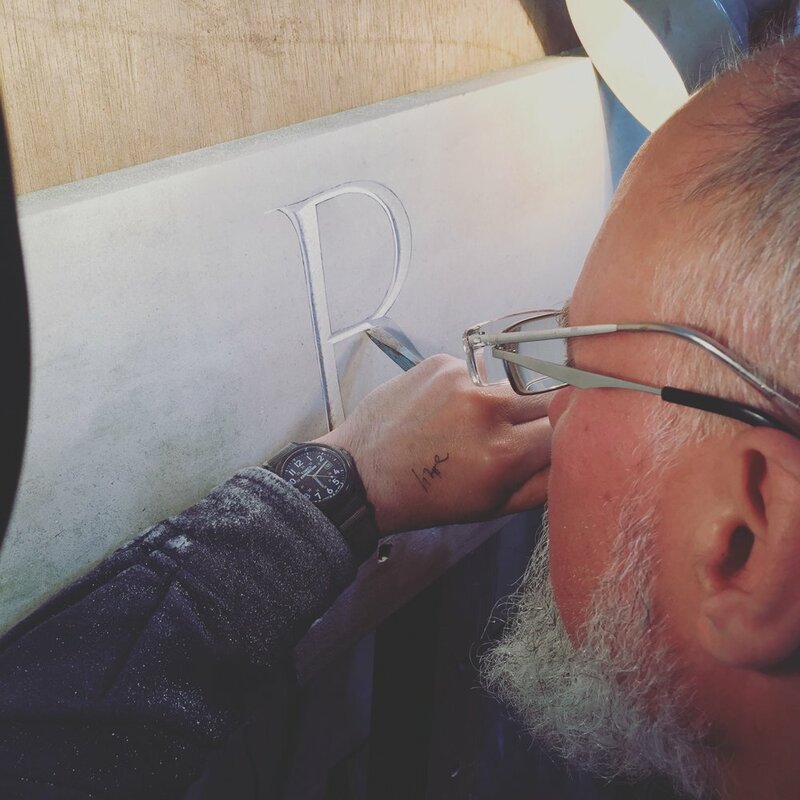 Lettercarving (or really any kind of stone carving) is a bit like tattooing: sure, there are tricks that can be employed to fix a mistake, but it’s better to avoid mistakes in the first place. The stakes seem very high indeed when you’re an inexperienced carver. Luckily, I did’t pysch myself out, and I did what I always do: just get stuck in. The pristine surface... Time to take a sharp bit of metal to it! Aside from being a fairly novice carver, my biggest challenge was the stone itself, which was very hard nabresina, chock-full of even harder shells. Early on, I realized I was not only going to have to take my time carving this, but that I was going to have to pay strict attention to what I was carving. Some sections were much shellier than others, and sometimes much harder. For example, If I were carving the center of an R (where the upright, leg, and bowl all meet), I would have to be very conscious if there was anything that would cause stone to pluck out or crumble. There were also all of the fine serifs to consider. Many of the long, thin serifs went through bits of hard shell, or had small holes from the grain of the stone in and around them. So great care was needed to keep the serifs intact. “X” marks the spot for the first cut. Much to my surprise, the carving was not quite as harrowing as I thought it might be (things are rarely ever as bad as they are in my own head!). Starting from the bottom line of letters, I worked my way up. (I saved the small numbers until after I had warmed-up a bit on the bigger letters). Generally, I took as much time as was needed to do each letter, carefully not to rush or cut corners (both literally and figuratively), as that’s when things always seem to go wrong for me. Here and there, tiny blow-outs or crumbling occurred, but these were outside my power to prevent - and luckily easy to fix. As I progressed through the alphabet, which is easily the most letters I’ve cut at once thus far, I began to gain confidence, eventually trying to get faster and more efficient as I went along - all the time careful to maintain quality and not rush any of the tricky work. By the end, I had easily cut my carving time in half - which is one of the things I’m most proud of. Eric, my teacher, had advised me to get every letter as finished as possible before moving on to the next one (as my initial impulse was to rough everything out, then go over it again). I was glad I took his advice. The idea of having to start all the way at the beinning again would have seemed daunting to me, in hindsight. After the initial carving, I did a rubbing of the whole alphabet and marked areas that were questionable or needed fixing. This served as an initial roadmap for any obvious corrections. This rubbing also helped point out a few small areas that needed to be filled in as a result of tiny shells bursting or crumbling. Luckily, there were very few of these spots and they were very minor. Once everything was filled, I did one more pass of looking over the letters closely and fine-tuning them. Any letters, or parts of letters, I wasn’t sure about I took rubbings of and used those to see any wobbles or flats. Two “B” or not to be, that is the question. I can’t say that I fixed every problem or sorted every wobble - in fact, I know this to be the case - but I do believe I removed most of the howlers and potential eyesores. As this is my very first alphabet, and I’ve done the best I can at this stage in my training, I try not to be too hard on myself, and I am generally very pleased with how the carving came out. All cut and waiting for a lick painting. In a future post, I will discuss the painting and finishing of my alphabet. Mixing color is something I quite enjoy, though I think my work will be cut out for me... Thanks! 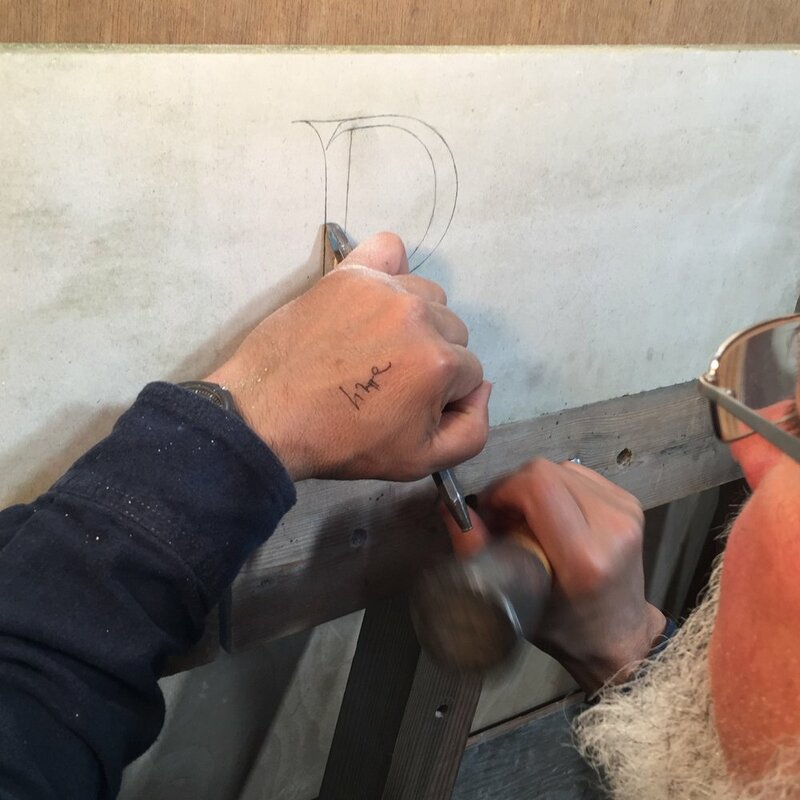 One of the major milestones of a traditional lettercarving apprentice is the creation of your first carved alphabet. Besides working as a display of style and influence, it is also the culmination of the myriad skills you learn as an apprentice: drawing, carving, painting, and many others. The original Gill alphabet in the V&A. The inspiration for my first alphabet was one carved by Eric Gill. This alphabet, carved very early in Gill’s career, consists of four lines of Roman caps. It’s chock-full of the sort of eccentric letters that Gill is known for but also very beautiful in its simplicity. The stone (which is on display in the V&A) was carved in Hopton Wood stone and adorned with a double-bead moulding around the outside - which was very typical of Gill. However, while this Gill stone served as an inspiration for my own alphabet, and helped establish the form and general aesthetic I wanted to achieve, it was very much a springboard from which my teacher Eric Marland and myself took in its own unique direction. A nearly-finished draft of my alphabet. Eric’s input and direction were immensely helpful and informative, and he helped me reach a set of letterforms that display both of our own sensibilities while still harkening back to Gill’s original alphabet. The stone I chose was a large piece of Nabresina, which is very close in look to the Hopton Wood Gill favored. Hopton Wood is generally not available anymore, so this was a great substitue. As a result of the size of the stone I chose, Eric suggested I sink the surface down a bit, which would both make the stone lighter but also allow for me to do a Gill-esque double-bead moulding. This stone was so hard! Using a point and claw was tough going. After multiple passes with a claw and chisel to even the surface out. This process was extremely challenging because this particular piece of stone was very hard and tough to carve. Plus, there was the fact that I had never attempted any kind of general masonry before! And while the process of masoning the stone was a bit of an endurance test (almost 90% of the masonry was done with hand tools), I learned a lot while doing it; and it also gave me more cofidence with a chisel, in general. The stone is finally masoned with a sunken panel and double-bead moulding. After the stone was masoned, I drew on reference lines for each line of my alphabet. My alphabet was then pounced down, or transferred, on to the stone using carbon paper. Once the basic layout was on the stone, the many adjustments to spacing and letter form commenced. Changes were larger and more obvious at first, but eventually things moved into a sort of fine-tuning period where minute, subtle alterations were made until every part of the alphabet looked correct. In a future post I will discuss the carving of my alphabet. Thanks! Over the last few months, I’ve been working on a lovely house sign that will eventually be fixed in Suffolk. What is really interesting for me about this project is that I had to carve raised lettering, which is a first for me. It’s also a large sign, as far as house signs go, which sort of sets it apart. Eric started by sketching on the letters looosely, to give them a bit of movement and life, then the drawings were tightened up and made more definite. It was then my job to carve out the letters and hen-peck the background (another first for me! ), to give the letters more contrast. Hen-pecking is when lots of small divots are carved into the stone with a point, instead of a flat chisel. It gives a wonderfully craggy texture to the background. Several passes of more refined carving were required to neaten everything up and make the hen-pecking look even and uniform. I also rounded and shaped the outside edges and corners by hand, which not only softened the look of the stone and made it look more organic, but also helped to protect the edges from breaking. The only thing left to do was to decide how we would paint the sign, and what color we would paint it. In the end, we decided to paint the background and leave the border and raised letters as natural stone. This would allow for maximum legability, which was important as this sign is to be placed on a sharp corner, and needs to read immediately. As for the color, the client chose a nice terra-cotta color. We carefully mixed several options and tested them on the stone, to be sure we got it right. The stone has now been painted and is awaiting some minor refinement. I think it looks pretty good, and I’ve really learned a lot while making it. I hope the client is as happy with it as I am! Over the past few months I’ve learned a lot; and when I say a lot, I mean A LOT. With so many skills to master and a full dock of work on the move, the idea of jumping into doing paid work was a little intimidating. I, of course, have been involved with helping out on paid work since day one, but taking charge of a project is a different matter. So when my teacher Eric offered to let me do the gravestone of a cat, I jumped at it like...well, a cat. Here was the opportunity to make a gravestone in its entirety, but in miniature. This not only made the process more manageable in practical terms, but also a bit less intimidating. Plus, the fact that this was a memorial for a cat, and would be placed in a private garden, also took a little of the pressure off - though the drive to make quality work is always there. 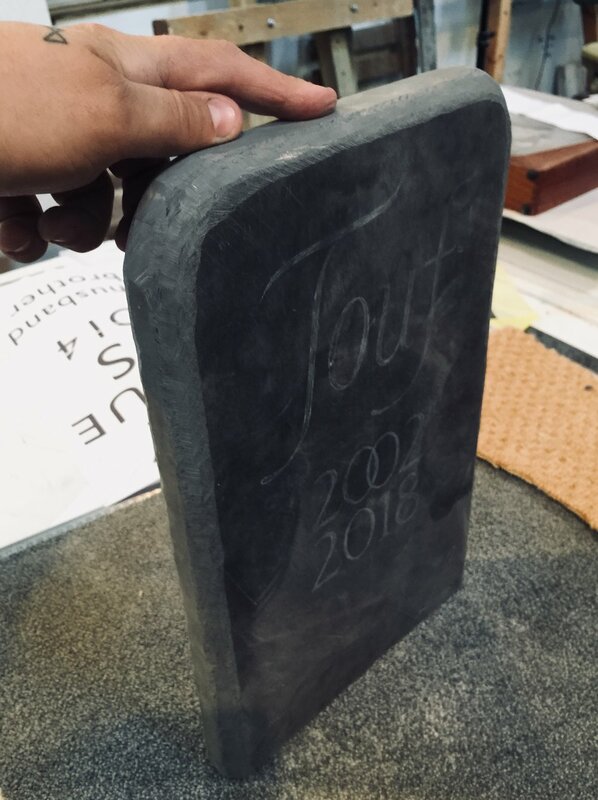 From beginning to end, I was responsible for designing, shaping, and carving this stone (with Eric helping me along the way). Most of the skills I’ve accrued so far in my apprenticeship were employed for this project. First, a suitable piece of stone was picked: we used a lovely little slab of black slate. Then the lettering was designed and drawn out. This step, as is usually the case, was the longest and most considered step of the process. We are letter carvers, after all! The next step was the shaping of the stone. The client wanted it to have smooth, pebblized edges with a slight taper towards the top. I accomplished this by grinding the edges and bulk off with an angle grinder, followed by shaping and smoothing with a spinner. The last leg of the shaping was done by hand with files and sand paper. It was a fair amount of work, but I think the finished product was well worth the effort. The lettering was then pounced down on the stone and the all-important carving commenced. I’m still not a seasoned carver, but I think I did a pretty good job. Eric then gave it a pass to tighten everything up. It’s really that last 5% of carving that separates good work from great work, and Eric is a master of the 5%! All that was left to do was to flood paint it and sand it off. Overall, I’m very pleased with the stone, and I feel a lot more confident in undertaking future work (which I have since completing it). Now on to bigger things! I’ve been an apprentice lettercutter for a bit over a month now, and I can confidently say I’m still really enjoying it. Every day brings a new challenge, a new skill to learn, another unexpected facet of the job. One project that has consumed a lot of our time recently is the carving and fixing of a giant caithness stone table, which was to be placed in a client’s garden. The table, which was six feet wide and over 700 lbs in weight, had to be rolled several meters then flipped onto a large track where it was slid/carried to its brick base. It was a massive bit of stone and it took four of us to get it where it needed to be, but the whole fixing was a huge learning experience and presented some very interesting problems to solve. The other big event was planning and hanging the Alphabet Museum show at the Lettering Arts Trust gallery at Snape Maltings. The show was curated by my teacher Eric Marland. I’d never hung a show before, much less a show consisting mostly of stone. We used so many different methods of mounting and fixing that it ended up being a bit of a fixing masterclass. There was so much great work in the show from several different countries, and though it was certainly hard work to hang, I think it came out great. The Lettering Arts Trust always hosts great shows and this one is no exception! So before I started this apprenticeship, I was essentially a self-taught lettercutter. I had a series of carving lessons with a local guy, read a bunch of books, and watched as many YouTube videos on the topic I could find (of which there are actually very few, and most consist of close-ups on the carvers hand, as opposed to what they are carving). So it was really awesome to have Eric, my teacher/boss/guru, give me a proper top-to-bottom carving demonstration where I was able to annoyingly hover over his shoulder and ask a multitude of obvious, if not potentially stupid, questions. Luckily, Eric is a patient man, a great teacher, and a heck of a lettercutter. Gee, you really R a great carver, Eric. A major part of my two-year apprentriceship is not only designing and carving letters, but also learning how prepare and install the work I do. For most pieces done in stone (such as a plaque or a gravestone) this is known as fixing. This past week Eric and I went out for our first fixing together. 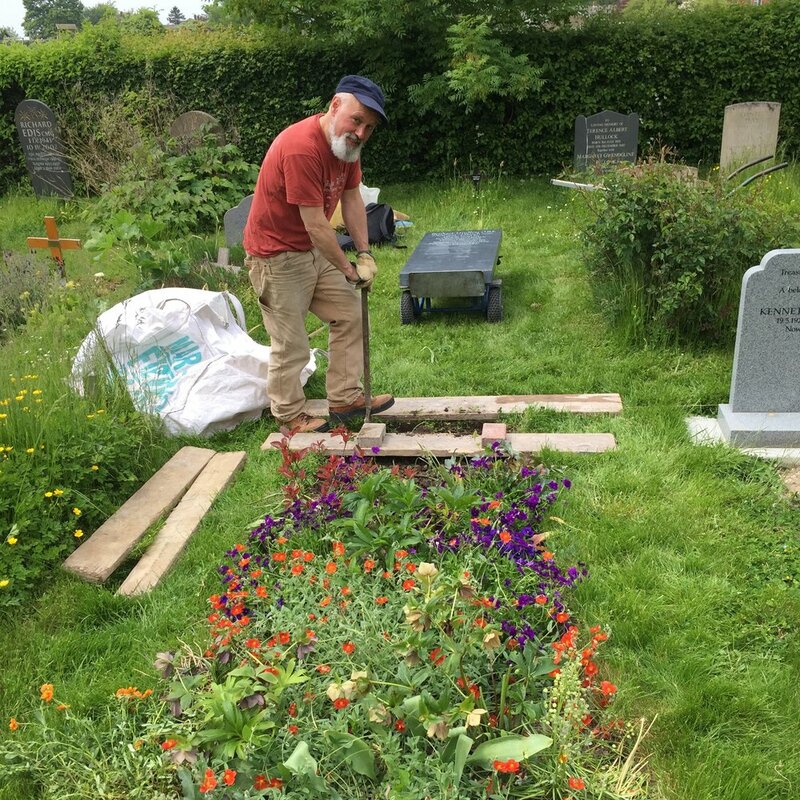 The task was to get a huge slate gravestone properly set in the ground of a lovely churchyard in Grantchester. First, you mark out the approximate footprint of the stone, careful to line it up and place it appropriately with the stones around it, then you dig a neat slot in the ground. The height requirements for memorials (and, therefore, the depth you dig your slot) varies depending on where you are digging it - a churchyard vs a public cemetery, etc. Eric hamming it up for the camera. Me using what my mamma gave me. After you’ve dug your slot, you place two bricks on either side. This will act as a base for your gravestone to stand on. Everything is tweaked to make sure the every part is level. We’re on the level, literally. Then you lower the stone in (mich easier said than done) and fill in the earth around it, careful to tamp it down as you go along. Voila! You have a fixed gravestone. That’s three inches of slate and three pills of Ibuprofen when I got home. Yesterday was my first day as an apprentice letter carver with the great Eric Marland. It’s been a hectic move from Bristol to Cambridge - complete with injuries, illness, and terrible weather - but I couldn’t have asked for a better first day. The chapel workshop where I will be working is truly the coolest office a guy like me could ask for! I spent the day at the Lettering Arts Trust in the amazing Snape Maltings complex. The Trust is funding my two year apprenticeship, so it was great to finally meet everyone. Plus, I was able to privately view their incredible Berthold Wolpe exhibit - which is a designer’s dream come true! I also got to hang out with the legendary Pieter Boudens and the very talented Robyn Golden-Hann - two letter carvers I really respect. On top of all of that, the weather was beautiful! You can’t really ask for more than that, am I right? 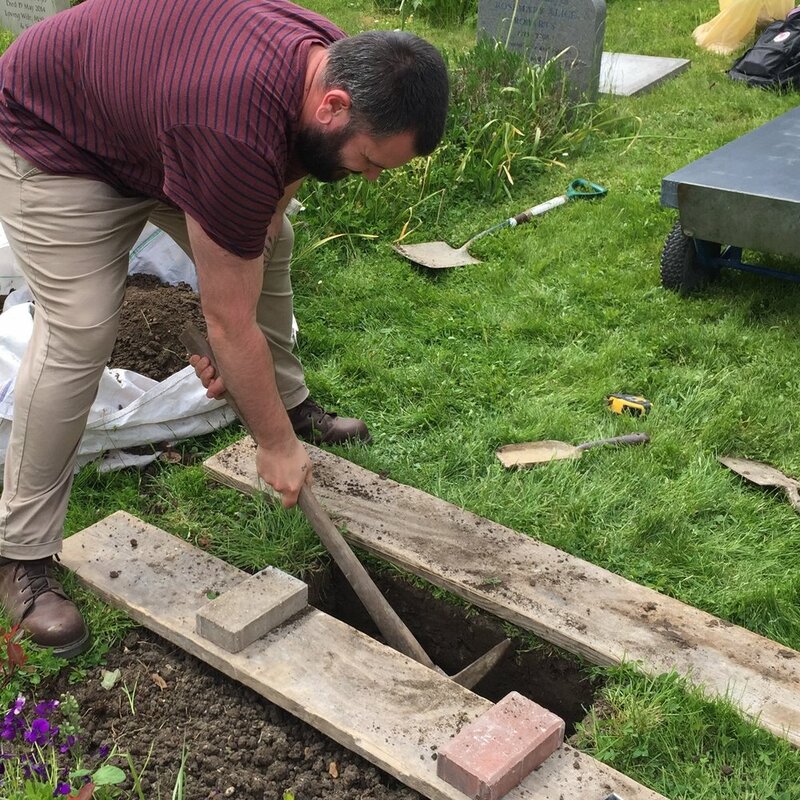 Recently, I took a trip to Arnos Vale Cemetery to do my very first grave rubbing. It’s part of some research I’m doing for the lettercutting apprenticeship I start in May. The kit I used, which I bought over a decade ago in a charity shop, dates from 1975. The paper worked fine, but the 43 year old rubbing wax was super hard and a real chore to rub on. Got a sore arm and black fingers, but it worked in the end! Some interesting stuff will be coming this way soon..